I remember taking a photography workshop years ago when camera’s had film. I was told that it is not unusual to shoot a whole roll of film in order to get one good shot—quite discouraging. Today with the use of i-phones, i-pads, point-and shoot camera’s, it is the norm to take pictures on a regular basis without much effort. However, it takes patience, skill, a good eye, the right equipment, the right timing, and great passion to get the kind of photographs that Sarah Cail creates. Sarah, who resides in the New Hampshire Lakes Region in the summer and Florida in the winter, captures the best of these two worlds that she loves. Sarah believes that her ability to reside in both Florida and New Hampshire has contributed to her desire to become a nature and landscape photographer. The mountains, lakes and wildlife of New Hampshire are her subjects while she is here. Her perfect day is spent capturing the predawn skies, sunrises, and sunsets. She drives back roads in search of new vistas. Her subject matter is not just the flora, fauna, and scenery of New Hampshire and Florida, Sarah also travels extensively to photograph. notably been Rick Sammon, known as today’s father of photography, Jared Lloyd, whom Sarah took a workshop from on the Barrier Islands, and John Lopinot, a well-known bird photographer. In talking with Sarah recently, she told me that along with discovering amazing images, she also has met some very special people. “These people each have a story to tell,” Sarah continues, “for example, I was photographing an old barn, and the owner was telling me how he wants to keep the barn for his family, but it has taken him 10 years just to repair the roof. The building is dilapidating faster than it can be restored.” Sarah cares about the story beyond the photograph. Her vision is more than just what she sees behind the camera. When I look at Sarah’s photography, I see a theme running throughout her work—one of passion and compassion and a love for nature, wildlife and the habitat that we all share. She has mastered techniques, but she has also met her goal of evoking an emotional response along with creating a moment of magic. Well done Sarah. Peter Ferber’s August show this year brought the usual crowds and excitement, with people lining up on the street starting at 5:45am. This exhibit features Peter’s classic watercolors as well as rich oils and an acrylic, an ink drawing, and intensely detailed paper cutout with a watercolor accent. Many pieces were sold in the first few minutes, but there are still several gems available for purchase. One of the pieces Peter created for this show began many years ago when he photographed the interior of a boat shed in the 70s. I remember when Peter first brought this painting in, and was delighted to title it “Relegated to the Future”. Another piece Peter gathered abundant research for is “The Steamboat Swallow”. This ink drawing is the second in a series of black and white illustrations that began with an interpretation of the old Mount Washington steamboat. The Swallow also evokes the feeling of a past, with lots of elegant line work creating the graceful silhouette of the ship. There are also small and large prints available of this original ink drawing. One of my favorite pieces in the show is a little acrylic painting that is a rare view for Peter to capture–Lake Wentworth. “Golden Point” is a rich sunset scene that shows the serene quality of the lake just before dusk. Peter’s show continues through August 20, so be sure you stop in a catch a glimpse of these stunning originals before they leave the gallery. Several pieces will be made into prints, but many more will not be reproduced. This is a rare opportunity to view a portfolio of work that reflects the beauty of the Lakes Region. Born in Brooklyn, NY in 1930, Helene Pierce knew from the very first time she could hold a crayon that art was what she wanted to do. In school, she continued to shine with her art. Knowing that it was difficult to make a living in the field of art, she chose a different career path. However, she did take a number of workshops and studied art on her own, all the time improving her skills. A family kept her very busy, but painting was always a part of her life. She painted every chance she could get. She studied with Betty Lou Schlemm, who is a member of the American Watercolor Society and a published artist. Helene also took classes at UNH with Sigmand Abeles, a well-known artist and professor, who’s work is very much revered. Helene and her husband moved to Amherst, NH first, then in 1991, they moved to Wolfeboro, NH. Helene travels to Rockport, Massachusetts, where she paints every Tuesday with a group of artists including her long-time teacher friend Betty Lou Schlemm. The group has been getting together in Rockport since the 1970’s! They paint outdoors in the summer. Helene has exhibited nationally and internationally, as well as widely throughout New England. She is the recipient of numerous national and regional awards. Helene’s professional memberships have included the New England Watercolor Society; The Copley Society of Boston, MA; The New Hampshire Art Association; Lorillard Wolfe Art Club, NY, NY; Academic Artists Associations, Springfield, MA; The American Artists Professional League, NY, NY; North Shore Art Association, Gloucester, MA; Sharon Arts Center, Peterborough, NH; The Bermuda Society of Arts, Hamilton, Bermuda. Her work has been represented by The Art Place for over 15 years. In the art world, she is known as a painters’ painter—an admiration by other artists of her ability to master the medium. Her medium of choice is watercolor, which she paints with fluidity and movement often choosing lush colors. Helene’s aesthetically pleasing still lifes show her ability to create volume and form, as well as depicting light and shadow. Equally appealing are her landscapes, placing the viewer in a pleasant setting or creating a moment in time where time might indeed stand still. Helene has an impressive body of work that span decades of painting. I am pleased to be surrounded by so much of her work here at The Art Place. Her exhibit continues through July 30th, and is featured during Wolfeboro’s Art Walk on Saturday, July 30th from 5 to 8. We will continue to show her work even after the current exhibit is down. After all, she will continue painting, and there’s a lot more of her art to show! I was asked today what the GRID means. New Hampshire is the home of 48 4,000 footers. These awe-inspiring mountains have not only have been the source for photographer Jeb Bradley’s inspiration, but have also served as a challenge for this avid hiker. Bradley began pursuing the GRID in 2009, and finished in early 2015. The GRID involves hiking each of New Hampshire’s 4,000 footers in every month of the year. That means that Bradley hiked all of the state’s toughest mountains even in the deepest months of the winter. His camera in tow, Jeb also viewed these peaks in every season of the year. His images capture frosted snowdrifts, vivid foliage, and crisp reflections in warm summer lakes. Very view people have seen New Hampshire’s mountains the way Jeb has–he is only the 49th hiker to complete the GRID–but he chooses to share his experiences through the art of photography. While I was helping to hang Jeb’s portfolio of works for his show at The Art Place, I asked him which photographs he most wanted to highlight. Not surprisingly, he pointed out his series on Star Lake, a stunning lake at so remote and high an altitude that it is unseen by most New Hampshire natives. Bradley’s crisp images teleport viewers to this nearly magical location, one of his favorite places in the White Mountains. Bradley’s exhibit at The Art Place continues through July 9. Don’t miss this show highlighting New Hampshire’s colorful seasons. The Hudson River was not the only subject matter for the Hudson River School of Art. Many of these artists, including Thomas Cole, traveled to the White Mountains of New Hampshire to paint more northern landscapes. The earliest artists were drawn to the White Mountains because of their irrefutable “sublime” quality. 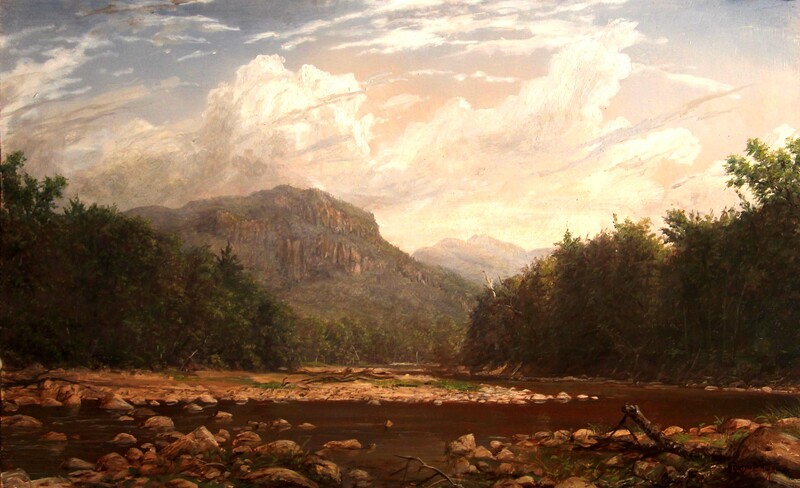 (Read more about this in our blog post: The Hudson River School of Art.) A devastating mudslide in 1826, called The Willey Tragedy, brought attention to the powerful nature and wild environment that was integral to the White Mountains. This feature was very attractive to romantic landscape painters, so they began to swarm to the north east. Benjamin Chapney was one of these traveling artists. 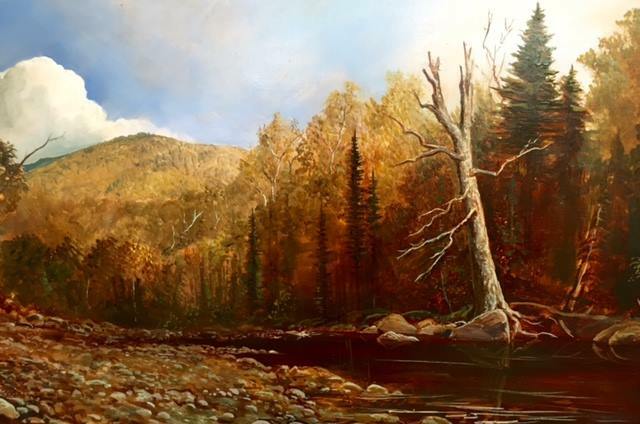 He fell in love with the White Mountains and made his home in North Conway so that he could continue painting scenes of this American wilderness. He opened his studio up to tourists and other artists, and this brought even more painters to the north. In Benjamin Chapney’s autobiography, he wrote, “The meadows and the banks of the Saco were dotted all about with white umbrellas in great numbers.” (Sixty Years’ Memory of Art and Artists) White umbrellas were a staple for plein air painters, and the draw of artists to artists fueled this region’s growing popularity. North Conway is arguably one of America’s first artist colonies. Just as the style of the Hudson River School died off over time, so did the popularity for painting northern New Hampshire. Eric and Lauren bring this work back into fashion not only with their painting style and subject matter, but with their lifestyle as well. This couple moved out of New York and created a home in Jackson, New Hampshire, to be near the source of their inspiration. Their connection to history is shown by their participation in The Jackson Five, a show hosted by The Jackson Historical Society, which will exhibit work of five artists who have lived in Jackson throughout history. Eric and Lauren’s show at The Art Place represents work that is beautifully representative of the White Mountain Art of the 19th century. Their paintings capture an untamed wilderness that still exists. They also strive to capture the same themes of the sublime, this time focusing on the fleeting status of our current natural world. Eric and Lauren’s show will continue through June 10, although we also represent their work throughout the year. Visit their artist pages: Erik Koeppel and Lauren Sansaricq. Our featured artists, Erik Koeppel and Lauren Sansaricq met at the birthplace of the Hudson River School of Art. The Kaaterskill Falls in New York is where this art style found its roots, paving the way as America’s first major art tradition. Erik and Lauren’s work reflects this romantic painting style, immersing the viewer in scenes that evoke awe of the natural world. The Hudson River School of art was created by a group of artists, including Thomas Cole, around 1850. Rather than an art academy, the Hudson River School was more of an artist community, with several of these well-known artists even working in the same studio building together. As well as being friends, they shared the same subject matter for their work–romantic landscapes. The Hudson River painters took advantage of the wilderness of America and accentuated it to create their work. Their paintings were distinctly American to international viewers, because they illustrated the untouched landscapes that existed in abundance in America during that time. These artists would travel to view these remote vistas and create sketches or miniature paintings that they would bring back to their studio to expand and elaborate on. The concept of painting from memory, as a tool to distill the most essential and dramatic parts of a landscape, was greatly encouraged. Another key element to the Hudson River art tradition was use of the “sublime”. This was a concept where the powerful and sometimes terrifying aspects of nature were captured in an image. This can be seen in the painting below by Albert Bierstadt. The dramatic storm clouds add an element of fear to this painting, making the landscape even more magnificent. The Hudson River School of Art died off around 1900, with new art styles coming into fashion. But Eric and Lauren have revived this tradition. They believe this style of landscape painting has more significance as people become more interested in preserving nature for future generations.